In my correspondence, I try not to pry as Malka is extremely private. After Tishrei last year, I was informed that a shliach and Rov in his community used her story in his drosha on Yom Kippur. So I contacted the Rov and he gave over the thought that he said. In short; “We all have challenges and some times that causes us to falter, but look at this woman, who has kept her commitment to her promise so strong, and I don’t know if our challenges equal hers. At the end of his letter he asked about her having a mezuzah. The Rebbe gave me a mezuzah and instructed that I put it up properly. the Gemarah in TRACTATE SHABBOS (!) on page LEV (!) = page 32b (so this is “the very heart of Gemorah Shabbos”) states the opinion that children become “not alive” due to the sin of not affixing a mezuzah…because the possuk of mezuzah comes right before the possuk of “L’maan yirbu yimechem V’YIMEI BNEICHEM” – that your children should live long in merit of mezuzah! Therefore by having mezuzahs I will merit to bring long life to (other’s) children. (I don’t know if this Gemorah is well known to the public or a private message but it can be shared with Rabbi ….. since as a Rov he may sometimes need to advise a woman that miscarried – to check her mezuzahs). I am sharing this now as this Shabbos is Shabbos mevorchim of Chodesh Elul. The minhag is to have your mezuzah’s checked in the month of Elul, and yes, Malka checks her mezuzah periodically. Also because the Rebbe mentions in a maamar that since the mammar of melech basudeh (The King In The Field) where the Alter Rebbe explains the meaning of chodesh Elul is printed on page 32 of Likkutei Torah it is the essence of Elul. So here too the Rebbe countered that not only is a mezuzah connected to Shabbos. It is essentially the heart and essence of Shabbos. This brings to a conclusion this segment of stories concerning Malka. 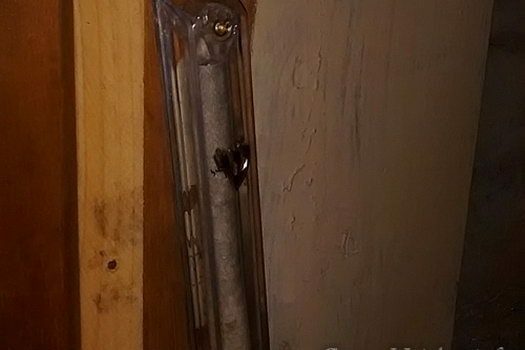 Picture of the Day: Tefilas Haderech in a Mezuzah? This story doesnt make sense after reading an earlier story. It simpky doesn’t add up!!! In one story it said that the shaliach bringing her matzo asked villagers if there us anyone Jewish in this town and was told that they suspect she is because she is only villager that doesn’t attend church. If the “only” outward sign of her jewishness was that she doesn’t attend church, obviously there is no mezuza on her front door!!! If she had a mezuza on her front door, everyone who knows what it is would know she is Jewish!!!! Her identity as a Jew would be the “sign” on her door – nothing to do with her not attending church. The matzo story disproves this story because that story implies she had no mezuza. This story disproves the matza story. The two stories contradict each other!!! There are ways to put up a mezuzah without the neighbors noticing it. Many goyim especially in a village with no yidden have no idea what a Mezuza is! What are you haking ah tcheinik? The Mezuza story probably happened AFTER the matza story. At time of matza story – there were no mezuzas. Your whole question is only if Mezuza story happened before the matza story. Mystery solved. But teaches how you can’t jump with assumptions. On Sunday I showed Rabbi Avtzon this comment and he said you know if i answer it, it won’t change that person’s opinion. He then opened up a kitzur shulchan aruch, chapter 11 law 9, which states clearly that if a person is living in an area that they are fearful the mezuzah might be stolen,there are two options of how to conceal it. He then told me that she evidently considered her situation similar to this and chose the first option of embedding it less than 8 cm, (which is a tefach) and then covered it up with the wood of the door frame. So obviously no one is going to realize that as this was done in Europe etc., but not in America. I asked him why didn’t you post that, and he replied, i posted it on the shluchim exchange for the shluchim to know that this is an option for a Jew that is not ready to publicly declare that he is observing a mitzvah, but on the website, i was afraid that some people may mistakenly think that it applies to them also. He then said, find me anyone that would make that connection of the page in the gemora and say it it the essence of Shabbos, that was unique to the Rebbe. But some people would rather cast aspirations than speak to me directly. Maybe she puts the Mezuza on the inside of the door. If she puts it up in middle of night, no one will notice her putting it up, but even the mailman will see the mezuzah the next morning! Who cares if the putting up isn’t notice?! 1. Sherlock wrote that goyim would not know/notice mezuza (but would notice someone not attending their community church). 3. Bochur wrote she might of had the mezuzah on the inside of door, so no one can see it from outside. 4. You, Dov wrote that the mezuza was embedded into doorpost and concealed. Dov, the other 3 explanations seems much better than yours which is kind of unusual. Why use that explanation? Why did you eat what you ate for dinner last night when you had something better to eat? So why did Dov give that explanation is because that is what Malka informed Rabbi Avtzon and that is what he said. Truth is better than fiction. He isn’t writing the story he is reporting it. Anonymous (#7), what I meant was that there are ways of putting it up in such a way that the mezuzah itself is not noticeable. Dov provided one such way. Some hang a piece of matza near door. It is a shmira. A mezuza is also hung near door and is a shmira. I see the connection…I think. Can you tell us which shaliach/rov? Maybe she should visit his Chabad House! The shaliach would not mind if you state his name! Sounds like a shaliach I know on California. Bet you it is him! Hint: Rov in LA. State your name first before asking for rov/shaliach name. Oh, you would rather not. I get it. But why don’t you get that rov also would rather not?! Tellme who you are and I will tell you the Rov that i corresponded with ten months ago. This rov shaliach would NOT mind that his name is given out. He gave a great drasha. What’s private about that? All who heard it on yom Kippur and saw this story, they all kniw it was him! What’s big deal to tell us his name – IF HE EXISTS?! I am Skeptic! If you tell us name of Rov, we can confirm the story! To be frank: That Rov offered her a Mezuza – doesn’t sound truthful. “Skeptic,” where do you see in the story that the rov offered her a mezuzah? He just asked if she had one. Ok, let’s “play it out”: The “rov” asks if has a mezuza, thinking she might not have one because she only keeps shabbos and kosher. If she answers no, then what? He says ok, have a good day. Or, he tells her to add it to her shopping list…even though she only keeps shabbos and kosher…sorry, it doesn’t add up! Why not ask this “rov” if you can tell us who he is for verification?! I really don’t understand what you’re getting at. He asked her whether she has a mezuzah. She said yes, so there was nothing further for the rav to do. Had she answered that she didn’t, then no, he wouldn’t have “told her to add it to her shopping list”; he would have explained to her the importance of this mitzvah, and referred her to someplace where she could buy one. What’s so hard to understand about that? Have you never gone on mivtzoyim, or talked to anyone who has? I don’t have time right now but over shabbos I will bl”n look up that Gemarah. I don’t think the words said are actually in the Gemarah. I think this comment provides a fascinating (and disturbing) look into a certain mindset. A chochom, then, would either look this up and post, or (if he doesn’t have the time) wait until Motzaei Shabbos, look it up and post. The opposite kind of person, though, must rush – less than an hour before Shabbos – to inform us that he “doesn’t think” that it says this. In short, see Avos 5:7, third item. Also see Mishlei 29:20. You are not being dan lkaf zchus! Your whole persona is lekanter! And when you write BMK you mock a mokom Torah (is the K for Koton?). So in the same breath you’re demanding that I be “dan l’kaf zchus” towards you, but then accuse me of nothing but “lekanter, tzchok and l[e]itzon(e)[u]s,” and somehow divining that the “K” implies “mock[ery of] a mokom Torah,” rather than trying to be dan me l’kaf zchus. Interesting, that. You don’t get it! I give musser for a toeles. It is poshut hochayach tochiach. But you are just motzi shem rah, and being mevazeh a talmid chochom. How great are the words of Chazal, who said אין אדם רואה נגעי עצמו! Halevai you had spent some time listening to the mussar shmuessen of R. Noson Meir Wachtfogel; you’d be talking completely differently now. The Rochatchover Gaon always held that every part of Torah is interconnected, so it’s no chiddush that the Rebbe could connect all mitzvos to Shabbos and Kashrus. The chiddush is that Malka was mekabel. 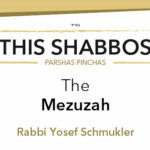 Are you saying that if someone doesn’t have a mezuza he is mechalel shabbos?! That part of keeping shabbos is to keep mezuza? Absurd! The story is very unclear. Did the Rebbe give her one mezuza or enough mezuzas for her entire residence and work-office? Please clarify this point that is missing from story. Also did Rebbe give her actual mezuza or money to buy a mezuza? If he gave mezuza, did he have it with him or did she need to cone back to get one? And if she needed to come back, did she get it from him or from mazkirus office? At that time her apartment was a studio one which is only one room. 2. Did he give $ or mezuzos? 3. Did he give it to her right then or have her pick up later? Not prying into her privacy, but filling in missing details! Ok, so it was ONE mezuza, but did the Rebbe have it on him and pulled it out of his pocket? Or did she need to come back to get it? Or did her give her money to buy the mezuza? I think he spoke to her about ahavas yisroel after the mivtza started and told her that the best ahavas yisroel is to make shidduchim! These are the stories that we want. Keep em comin. Get more of them from her. Besides, if you don’t, they will be lost. Mi yodaya im kozos higata…Rabbi Avtzon, this might be YOUR shlichus ans avoda. I was asked numerous times what do I see in this entire story. My answer is three points. Malka felt she was abandoned and the Rebbe reassured her that nor she or any Jew is abandoned. While the Rebbe mentioned Shabbos and kashrus in subsequent guidance he showed that by being careful in those two areas one becomes connected to almost or perhaps to the entireTorah and mitzvos. And finally, yes that while Malka has a special neshoma, never underestimate what and how one kind gesture can inspire someone else. These are in my opinion the core of the saga. Obviously each lesson is a teaching point in its own. The Derech to do kiruv is getting a commitment to a core mitzvah and expanding it. There is a Medrash that a person committed not to lie and this caused him to keep all mitzvos. When she was 12 he saw what will happen when she is 18 and 26 and 35 and 50 and 70…He gave her advice then to guide her in nisyonos she will face. The advice at 12 made very little sense at the time, but it spiritually saved her life years later. It is time for a new story! There is no story that gets as many readers, comments and connection with our lives as the Malka Stories. Each part inspires, teaches things I never knew or thought of. The stories apply to all ages and all levels, even to those not Lubavitcher or those not religious. The range of readers and comments show how important these stories are. Whatever developed with some of the people that got involved in her story? I remember Zahava – the one who wrote comments in Hebrew and remembered Malka from seminary? And what about Victoria – that reached out for guidance? Snd the many others who were inspired, like the children who rejoined their estranged parents – did thst flourish? All these loose ends! All the seeds planted – which of them sprouted and blossomed? We need a follow-up to “complete” the story! A new series of Malka Stories!!! It reads like a Lubavitcher trying to create believable story. Until some comes forward as Malka I’m going to choose not to believe these stories. I wouldn’t repeat them either. We have so many amazing stories of the Renbe that are verified and confirmed. Skeptic, I am much more skeptic than you. There is something off about you claiming to be skeptic. I choose to believe that you are not a skeptic at all. There are many amazing skeptics but you aren’t, you just want to be one. Until you come forward and prove that you are a skeptic, I choose not to believe that you are one. Anyone can say they are a skeptic, but let us see you prove it! I am sad that this was the final story from Malka. I would like to keep hearing updates about her fascinating life and the guidance she received from Rebbe over a few decades. I thank her for the few encounters she shared with the world and hope she can reclassify her personal details and share the balance of these encounters. I do not pry vs I try not to pry. You try not to pry but I assume you still do your job diligently and pry enough to get the story extracted. Good for you. And thanks to Malka for giving us this glimpse that was unknown to many. A yidden can be a yid even on a desert island. Yidden remained yidden in Siberia or in desolate places. I’m sorry. I don’t buy it. There’s something off about all of these stories. I’m sorry “skeptic” but I don’t buy it that you are a skeptic. There is something off about you claiming to be a skeptic. Can you step forward and really prove that you are a skeptic? Did the well spring run dry?! Why? This brings to a conclusion “this segment of stories concerning Malka”. This segment ends, but there will be other segments of stories from her fascinating life. I already have a mezuza on my front door (my rabbi said that the entrance door is all that is required). I will be buying one for all the other 3 doors in my house. Pleae inform the sofer that you are sephardic and desire them to be written in the style (ksav) that sephardim write it. also I reached out to a sephardic Rabbi inquiring how your name should be written. Until then, i would say, use the name Vikky, as some sephardim do, and also find out what your Jewish name is. I asked my rabbi for a Hebrew name that is similar to Victoria and he came up with Vashti. I thought he was joking but turns out he was serious. Seems Vashti means a beautiful woman. I don’t know if I should laugh or cry. Your rabbi suggested you adopt the name Vashti and I suggest you switch to an Orthodox Rabbi. Vashti was an evil queen, wife of Achashverosh (Story of Purim). Your rabbi must know that, but many liberal rabbis are “accepting” of all the evil people by seeing “the good” on them. I am upset that the rabbi told you Vashti means “beautiful woman” – it is offensive (and inappropriate for a man to say this to you). Find yourself an Orthodox Rabbi or better yet a Chabad Rabbi. If I may mix in, Victoria, I’d venture to say that that wasn’t such good advice. Perhaps Vashti does mean beautiful; the bearer of that name in the Book of Esther was, at any rate. But she was also wicked (she forced Jewish girls to work on Shabbat, for example), and you wouldn’t want to model yourself on such a person, G-d forbid. So a suggestion: perhaps consider instead Devorah, the leader of a great victory of the Jewish people over their enemies (thus preserving something of the meaning of your current name). Thank you Rabbi G. I wanted a rabbi to pick my name and was troubled by the suggestion of my rabbi to use the name Vashti. Since you are a rabbi, I will use the name you picked, Devorah. I think Devorah captures my character. She had leadership, wisdom, pursued justice, acted with heroics, defied the norm that suppressed and excluded women, at the time it was considered immoral for women to sing – but she did, women were excluded from the legal profession and it was unheard of a woman to sit as a judge – but she did, she broke the barriers and entered areas reserved exclusively for men. I should make clear that my rabbi did not suggest I adopt the name Vashti strictly because of her beauty. He pointed out to me the many admirable similarities between Vashti and my own character. Vashti was a pioneer of the Feminist Movement. At a time when women were considered inferior to men, ruled by men and used as objects owned by the husband, she stood up and claimed women’s equality. She considered herself and equal or even superior to her husband. She objected to the accepted norn of those times that “man is the ruler of his house” and she defied being ordered by her husband. She refused to be objectified and used for entertainment. This took great heroics and sacrifice – she was prepared to, and did indeed, give up her life for these great values. My rabbi explained that these character (and her beauty) mirror mine. Although Vashti had character flaws, no one is perfect. Indeed, there are no explicit indications actually recorded in the Book of Esther to suggest that she was wicked or evil, because that was not the highlight of her personality. Any “wickedness” is found only in Talmudic or Medrash legends. Although both Vashti and Devorah have characteristics that I admire and resonate with me, but I agree that Devorah is more appropriate. I identify with many character exhibited by Malka. She also defied the norm of the 50’s that “a woman’s place is in the kitchen”, certainly among the chassidic ultra Orthodox of that time. She has other parallels with my personal life too which I won’t get into. Sorry but Talmud and Medrash are not “legends”! “Legend” is defined as: a traditional story sometimes popularly regarded as historical but unauthenticated. The only historical but unauthenticated portion of Judaism is the Conservative and Reform. They are unauthenticated! But the Torah, which includes Talmud and Medrash was given to us in Sinai from Hashem! Anyone that does not believe so is a kofer (heretic). Your “rabbi” told you allthese wonderful things about Vashti, did he tell you that she was the daughter of Nevuchadnetzar, who destroyed the Bais Hamikdosh and slaughter cruelly hundreds of thousands of Jews. Vashti was a rabid anti-semite like her father. She hated Jews. Imagine Hitler having a daughter with the same hatred for Jews as her father, and then your “rabbi” speaking praises about her and suggests that you use her name! Your “rabbi” is an authentic kofer (heretic) and anything he says is suspect. Every Jewish woman is a Malka (- queen). We are all daughter of the King and celebrate our sisterhood with a love for each other that transcends time and place. We are all of royalty as we fill our mission in life which is set out in our Holy Torah. The mission is difficult but together in unity we shall succeed. Genuine Judaism includes belief in the Divine origin and the utter truth of both the written Torah and the oral Torah (the latter as transmitted, generation to generation, from Moses onward, and eventually written down as the Mishnah, Talmud, Midrash, etc.). To that extent, Rabbi K is correct; if your rabbi doesn’t believe in these basic ideas, then it is time to find a rabbi who does. With that said, though, that doesn’t necessarily mean that every Midrashic account is to be understood in its most literal sense; some of them are indeed meant metaphorically. (Take the case of Vashti, for example: the Talmud tells us that she grew a tail and therefore didn’t want to appear to Ahasuerus’ party, there are reliable Jewish sources (Maharal of Prague) who see this as a metaphor for a “heaviness” or laziness that she felt.) So the lesson is a true one, but there can be different understandings of it. In short, then, calling these Midrashic accounts “legends” isn’t necessarily heretical, as Rabbi K is insisting; but the use of that terminology may indicate that your (and your rabbi’s) understanding of Judaism and allegiance to it are in need of some adjustment. I asked my rabbi to comment on Talmud stating that Vashti grew a “tail”, he said a “tail” is a metaphor, still used today in Yiddish (shvantz) to mean a male organ, hence the Talmud is saying she became masculine with a male organ..
she has no clue how special she is. Which sofer checks her mezuza periodically? As a sofer stam, I would be fascinated to see such a mezuza. Can we presume the Rebbe wrote it himself? 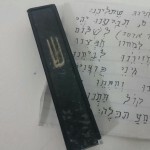 The mezuzah is ksav Ari that she found out by the sofer who checked it. He told her it is extremely mehuder. It was wrapped in seran wrap and covered by the white coated paper with a shin on it. The arrangement she had was that a week before she came to 770 the Rebbe received her letter informing him of what day she would be coming etc. So whenever the Rebbe gave her items as the mezuzah Hayom Yom mincha maariv etc. He had it with him on that day. There was no need to instruct Rabbi Klein to go and bring it. ALRIGHT…please explain why these details were left out of the original story….yep, I am suspicious and I am “Skeptic”! Avner, I believe you and many others are asking in truth to learn, and therefore I will respond. When I chose to post one of her stories, I submit it to her in the beginning of the week. This gives us both time to review it and put it out properly. She sometimes adds (or deletes) details and then it is sent out on Thursday night. Ten months ago, when I was informed that Rabbi – used it in his Yom Kippur drosha, I informed her of that fact. She replied, what did he see so special about it and he replied. He then added, that I should advise her that she can conceal the mezuzah, and therefore he as a Rov is mentioning this to her. At that time, I was under the impression that she didn’t have one, as it is neither Shabbos or Kashrus. She replied, graciously declining the Rov’s offer by explaining the Rebbe gave her one, and it is indeed hidden embedded in the frame. At that time, I asked Why one and reminded her that it is many years since the Rebbe gave it and she should have it checked. The reply was that at that time she had a single room apartment and indeed periodically [when she visits major Jewish cities] the mezuzah is checked and the sofer informed her that it is beautiful and mehuder. I was satisfied, and I combined the various emails made it into one segment and posted it. Reading the comments, I do not feel obligated to answer every question to unknown people. Yes whoever speaks to me directly receives much more information. If I say which Rov brought it up and people confirm it with him, is that going to convince then? I doubt it. I offered to say it of the person says who they are. However, there are a few comments that I do try to answer. For example today I spoke to a Sephardic Rov whose mother’s name was Victoria, and his daughter is Vicky and asked him how I should respond to Vi-toria. He thanked me for bringing it to his attention and will do some research on it. Therefore after reading the initial 40 some comments I emailed a few questions o Malka. Size and Ksav. When she responded that it was the Arizal’s ksav I thought that is an important piece of information. When we encourage a Jew to buy tefillin or Mezuzos, it doesn’t have to be the Alter Rebbe’s ksav, their ksav is excellent. Once I posted it, I decided to add the other details she informed me this week as well, that it was 12 cm and how it was wrapped. You ask isn’t that unusual? And the response is not at all. In Lubavitch houses, we try to not use thick plastic or wooden and especially metal cases for the mezuzos. Is It for Kabbalistic reasons or whatever and how about the outside of the house, that ask a Rov. So I thought it would be good to know that the Rebbe gave her the mezuzah as he would have it in his own house. If you wish to continue this conversation, do so directly to my email. I wish you and all a kesiva c’chasima tova. THe posssuk quoted states: “L’maan yirbu yimechem V’YIMEI BNEICHEM” but continues “al ha’adoma” (on The Land) which refers strictly to Eretz Yisroel. If so, how is this applicable to someone living in Chutz Laaretz?! “Al ha’aduma” means on Earth, it does not require living in the Medinah. Only a tziyonie rachmuna litzlun would claim that “al ha’adooma” means the land run by anti-religious so-called yidden that incite goyim. Satmar Man, you do realize, don’t you, that the posuk continues אשר נשבע ה’ לאבותיכם לתת להם? That does refer to Eretz Yisroel. Nothing “tziyonish” about it, unless of course you’re telling us that you don’t say Krias Shema every day because it involves mentioning “the land run by” etc. Question on Gemarah: it might be that the beginning of an answer is with a Gemara in Berachos 8a, where R. Yochanan wonders how people live to old ages in Bavel (given that, as you mentioned, the berachah is specifically for Eretz Yisroel), and the answer is that they daven regularly in shul. (Maharsha there explains the connection: the shuls will eventually be brought to Eretz Yisroel in Moshiach’s times, so they’re to a certain extent part of Eretz Yisroel now too.) Perhaps, then – and I’m not sure of this – much the same is true more generally when a house has a mezuzah placed on it: this makes it an “extraterritorial” part of Eretz Yisroel. Rabbi G from BMK – asher nishbu is the promise “v’hu’uretz noosan livnei udom”, the entire Earth was promised to “atem k’ru’yim udom”, b’rayshis: bishvil yisruel.. So what do you make of Devarim 11:9, על האדמה אשר נשבע ה’ לאבתיכם לתת להם ולזרעם ארץ זבת חלב ודבש? Are you going to now claim that the whole world is זבת חלב ודבש? And no, that Hashem created the entire world בשביל ישראל is not at all the same as saying that He swore to give it to our Avos and to us. Are you chas v’shulem saying that the Medina is זבת חלב ודבש? Since the churban bayis shayni the land that was once ours is not זבת חלב ודבש until the geulah! The area of land that happens to occupy the land we once has is not זבת חלב ודבש! The shevuah לתת להם will only happen when the geulah arrives. In fact there is a shevah NOT to occupy the land situated on our former land until the Goyel Tzeddek arrives. And no, אשר נשבע ה’ לאבותיכם לתת להם is in force now too – כימי השמים על הארץ (the heavens are above the earth during galus times too!). Yes, ומפני חטאינו גלינו מארצנו; yes, there are the shalosh shevuos, although to what extent they’re halachically binding (if at all) is a whole other discussion. I’m aware, of course, that Reb Yoel held they are. But the relevant shevuah is שלא יעלו ישראל בחומה, not that we’ve (chas veshalom) lost our connection to it. Rabbi G, According to you, that a house with a mezuza becomes “part of EY”, why does the Gemara in Berachos 8a answer “because they daven regularly in shul” (therefore they are “al haadama”), even if they wouldn’t regularly daven in shul, just by having a mezuza they (and every yid with a mezuza on his house) are “al haadama”? Bochur, you sound like you have a good head and potential for gadlus. Switch over to BMG and I will help build and make you into an Odam Gadol. I give a chaburah that you would enjoy. As reward, I will then tell you pshat in this gemarah (or any other in Shas Bavli, or even Yerushalmi – which I complete twice). The kushya is not on the story here or on Rabbi Avtzen, but rather on the apparent contradiction between the gemarah in shabbos 32b and brochos 8a. In shabbos 32b the gemarah implies that having mezuza gives long life everywhere, while in brochos the gemarah implies that long life only applies in EY. All this talk of Eretz Yisroel and lmaan yirbu…I think Malka must be getting on in her years to 120. Did she make plans for the future? In a village without Jews, there is no Chevra Kadisha or Chesed Shel Emes. It would be tragic if she ends up in a goyish cemetery. And her estate taken by the State…Did Rabbi Avtzon talk to her about After 120 and a Will? Actually, the Gemara in Shabbos says that children die due to the sin of failure to keep the mitzva of Mezuza, derived from the possuk of mezuza is followed by the reward to have a long life and life of children in Eretz Yisroel. The Gemara does not promise such a reward of long life and also life of children in Chutz LaAretz. Therefore your kashya is not on the Gemerk but on this story. Here, there was a promise of this reward of life for (others) children by keeping mezuza. That is inaccurate, since Gemara only makes such a promise of this reward in Eretz Yisroel. Nope, Lamdon. That Gemara does not limit its statement to Eretz Yisroel, and indeed it doesn’t quote the words על האדמה אשר נשבע ה׳… at all. In Kiddushin 34a, too, where the Gemara discusses how we know that women are obligated in the mitzvah of mezuzah, it also just cites the words למען ירבו ימיכם, and observes that women need long life just as men do. Bear in mind that mezuzah applies equally well outside Eretz Yisroel as in it. Ultimately, maybe that’s the straightforward answer to the question brought up in this thread: the Gemara evidently understands that למען ירבו ימיכם וימי בניכם stands by itself. Brochos 8b states that when R’ Yochonon heard that there exists old yidden in Bavel, he was surprised, because the possuk says L,maan yirbu yemeichem…al ha’adoma, and they were not living al ha’adoma. When he was told that they attend shul early and late, he understood that is why they live long. The question I originally had was, if mezuzah grants a person “yirbu yemaichem” even in Chutz L’Aretz, why was R’ Yochonon surprised that there are old men in Bovel? Clearly R’ Yochonon held that any zchus of a mitzvah like mezuzah that grants “L’maan yirbu yemeichem” is only applicable “al ha’adoma” – in Eretz Yisroel? R’ Yochonan heard there exists old yidden in Bavel and was surprised. Why was he surprised? There are ways to earn long life even in Chutz L’Aretz! According to your pshat, R’ Yochonon would need to also hear not just that they are old, but that also live in unusual dwellings (as examples listed above) which exempt them from mezuza! That vital piece of information, that these old yidden live in unsual dwelling that are potur from mezuza, should have been stated in the Gemorah !? Can you please explain your pshat? With greatest respect, I have a tzorich iyun on it. Please explain so that I can understand. I want to thank you, first of all, for keeping at me on this. ומחבירי יותר מרבותי; your question has impelled me to look up some sources on the subject, and to learn more about this myself. Pnei Yehoshua on that Gemara in Berachos addresses this issue. He writes that R. Yochanan knew, on the one hand, that the mitzvah of mezuzah (which is equally applicable anywhere, and which presumably these people were observing) brings long life. On the other hand, given that the posuk does continue על האדמה אשר נשבע…, that would suggest that it applies primarily in EY. So he was bothered by the fact that there are _more_ old Jews in Bavel than in EY, and also _more_ old Jews than non-Jews there. The answer, then, is that the posuk about regularly attending the shul and the beis midrash also uses the term “mezuzah” (לשמור מזוזות פתחי), thus expressing the idea that it brings about the same effects as mezuzah (and, presumably, that since that posuk doesn’t mention anything about EY, there’s no such geographical limitation on it). Ben Yehoyada, also on that Gemara, takes a different tack. We usually say that שכר מצוה בהאי עלמא ליכא, the reward for mitzvos isn’t usually given in this world. The juxtaposition of למען ירבו ימיכם with על האדמה אשר נשבע means that only the combination of these two mitzvos, mezuzah and dwelling in EY, brings about long physical life. So how are they living to old age in Bavel? The answer, then, was as Maharsha says: the shuls and batei midrash are an extension of EY, so that these people, too, had this potent combination of the two mitzvos. Ahavas Eisan (printed on the side of the page in the standard editions of Ein Yaakov) gives yet another answer. There’s a Gemara in Nedarim (22a, bottom) where R. Yochanan himself refers to a posuk implying that people in chutz la’aretz are more prone to anger (ונתן ה’ לך שם לב רגז). And that, in turn, makes a person more prone to other aveiros, which would then cause him to be judged unfavorably by Hashem and his life shortened. How, then, wonders R. Yochanan, are these people living to old age in Bavel? Even if they’re keeping the mitzvah of mezuzah and other mitzvos that bring long life, wouldn’t that be canceled out by their tendency to anger? And the answer is that the shuls and batei midrash have the ability to lift a person out of that tum’ah into a state of taharah, and thereby to overcome that tendency to לב רגז and to merit long life. ותן לחכם ויחכם עוד. Please G-d, I’ll look up more sources on this when I’m able to. I knew there must be an answer, since the Rebbe used Gemara of Shabbos 32b with regards to mezuzah in chutz l’aretz. I am so happy to see the various answers. I agree to what Rabbi K wrote on a previous segment that sichas chullin tzrichin limud, that even causal directives of the Rebbe require us to toil if we wish to glimpse into the depth behind his words. This was just proven here. To skeptics and doubters: who has such wide and deep Torah knowledge to fabricate such details of these stories?! R’ Yochonon heard that “ika savi b’bavel”, there are yidden in Bavel that have a din of saiva – they are old and seasoned IN THEIR YIDDISHKEIT. He was shoked, how can a person remain loyal to yiddishkeit in Bovel, to have arichas yomim – living as a yid, can only be in EY! The shock wasn’t that they grew old on their passports, but old as Yidden in a goyish environment! However, when he was told that they start and end each day in bais hamedrash he said – THAT is what keeps them as yidden. The old age was never about longevity, a rosha is dead even when alive. Here they were alive, like Malka, in Bavel, a place of goyim, like Malka! What kept them? Two things: Starting and ending the day in Bais Hamedrash, like Malka, two things, shabbos and kashrus. The story, the story about the story, the gemorah of the story, the lomdus of the story.The story of the story about the story is to begin next week. Moishe’le, You scared of a bit of Gemorah? Can’t a chassidishe maysseh have a little Toirah in it? This is story of real lfe, and guess what, real life isn’t perfect. The pieces don’t always fit perfectly like a puzzle. The directions given by a Godol B’Yisroel are always meyusad in Toirah, and not mere boich sevoros. So of course there is a connection between advice given by a Talmid Chochom and Toirah. And there is a story behing each story, where the person comes from, how it came about and what happened after the story. Be happy you are being given the bigger fuller picture and not just one small piece of the puzzle. These stories are amazing, but I find the comments equally amazing. Some are thoughtful, some are scholarly, some are humorous and some plain silly. I enjoy reading them the way I enjoy Letters to the Editor of magazines, which share the thoughts of other readers. Thanks CH.info! I wanted a rabbi to pick my name and was troubled by the suggestion of my rabbi to use the name Vashti. Since you are a rabbi, I will use the name you picked, Devorah. I think Devorah captures my character. She had leadership, wisdom, pursued justice, acted with heroics, defied the norm that suppressed and excluded women. At the time it was considered immoral for women to sing – but she did. Women were excluded from the legal profession and it was unheard of a woman to sit as a judge – but she did. She broke the barriers and entered areas reserved exclusively for men. I should make clear that my rabbi did not suggest I adopt the name Vashti strictly because of her beauty. He pointed out to me the many admirable similarities between Vashti and my own character. She considered herself and equal or even superior to her husband. She objected to the accepted norn of those times that “man is the ruler of his house” and she defied being ordered by her husband. She refused to be objectified and used for entertainment. This took great heroics and sacrifice – she was prepared to, and did indeed, give up her life for these great values. My rabbi explained that these character (and her beauty) mirror mine. Although Vashti had character flaws, no one is perfect. Indeed, there are no explicit indications actually recorded in the Book of Esther to suggest that she was wicked or evil, because that was not the highlight of her personality. Any “wickedness” is found only in Talmudic or Medrash legends. I identify with many character exhibited by Malka. She also defied the norm of the 50’s that “a woman’s place is in the kitchen”, certainly among the chassidic ultra Orthodox of that time. She has other parallels with my personal life too which I won’t get into. How did this story suddenly become a Purim story? “Skeptic,” why not? The story of Purim is ultimately about קימו וקבלו היהודים, our wholehearted re-acceptance of Torah and mitzvos. That is the process that Malka has been going through, the process that Devorah is going through, and the process that each and every one of us has to go through. This is amazing, now that we are within 40-days before Rosh Hashana, mazel tov to Vikky-Devorah as she takes a new name (taking a name must be done publicly – and this site is a public one!) and gets also gets mezuzahs for her home! What a merit to the Rov and Shaliach that started this (last Yom Kipper – the seed grew into a tree!!) in such a meritorious time! KVT! As Elul approaches, wishing Devorah and this Rov-Shliach a good and sweet year. Maybe he can now add part two to last year’s drasha! Skeptic, did you follow the story of Malka? Malka, like Queen Esther, lived among goyim and would get consultations and directives from Mordichai Hayehudi, the leader of most of the Yidden at the time (rotzuy l’rov echov – v’lo kol echov – he also had opponents from other gedolim). A tefach is approx 4 inches. so a room less than 4 x 4 tefoim is around 16 inches x 16 inches! Hi, this is Malka (from the story). I would like to meet with you. If you can be at the Ohel (resting place of Rebbe) on Sunday (or Monday) of Labor Day Weekend, please let me know. Rabbi K from BMG. Do you have time to daven after spending so much time making comments? Wishing Malka and Devorah a meaningful meeting. I hope others will respect their privacy and allow them time to focus and inspire one another.Hatzlocha! Why does the Gemarah stress b’ovon mezuza bonim meisim. Why “bonim”? The possuk starts with llama yirbu yemeichem (before yemei bneichem), so Gemara should say b’ovon Mezuza ” anoshim” meisim (not “bonim”)??? That whole section of the Gemara is talking about things for which בנים מתים (r”l), and for most of them the pesukim brought as proofs do refer only to the children and not to the person himself. So I would assume that that’s why it uses the same expression in connection with mezuzah, but not to imply that in this case it refers only to the children, given that as you said the posuk brought for this refers to both. In fact, in Shulchan Aruch, Yoreh De’ah 285:1 (beginning of Hilchos Mezuzah), it says explicitly that “whoever is careful with [the mitzvah of mezuzah], _his life and the lives of his children_ will be lengthened,” and the converse. Leave a Reply to "I try not to pry"